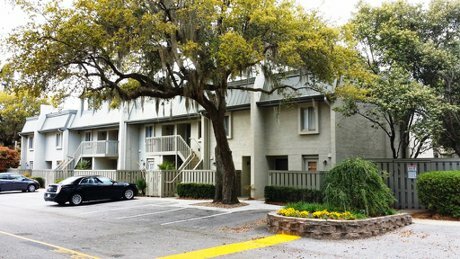 Surf Court Villas are second-row ocean and perhaps the most popular condominiums with vacationers on Hilton Head Island of any beach-oriented complex. The 2-bedroom (1,189 square feet) and 3-bedroom (1,516 square feet) are mainly townhomes, but there are eight downstairs flats within the building that are the smaller two-bed floor plan. Pets are allowed outside the complex, but not inside the courtyard where the pool is located. These villas are very good income generators as they are directly across the street from a dedicated beach walkway. Walk to the ocean in only a couple of minutes from the ocean even from the back of the complex. For additional information on Forest Beach Real Estate, return to the neighborhood main page https://www.thepattisallgroup.com/forest-beach/. Listing courtesy of Weichert Realtors Coastal Properties. Selling Office: . Listing courtesy of Dunes Real Estate. Selling Office: . Listing courtesy of ERA Evergreen Real Estate Co. Selling Office: . Listing courtesy of Oldfield Realty. Selling Office: . Listing courtesy of Sea Pines Real Estate South Beach. Selling Office: .